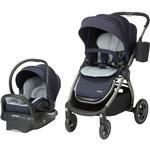 Families love the Maxi-Cosi Adorra Stroller! It has the supreme comfort you want to provide your child and all the features youve come to expect from a premium Maxi-Cosi product. Youll enjoy taking strolls with your newborn in carriage mode which features a full recline and provides a secure enclosed space to keep your baby comfy starting right from birth. As they grow, you can use the stroller mode with the seat in either parent or forward-facing positions, allowing your child to see you during the ride or giving them a view of the road ahead. 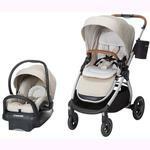 The Stroller includes a Cozi-Dozi infant support for smaller babies and the super soft fabrics and padding ensure a comfy ride. Youll be comfortable too with an adjustable handle that you can customize to the best height. The extra-large basket flips down for easy access and expands to fit larger items. The cup holder and storage pouch give you a handy place to store smaller items. The seat liner not only makes the Adorra the comfiest Stroller for your baby, but also reverses so that you can easily get a new look. 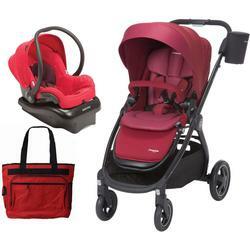 When youre finished enjoying your day out with baby, the Stroller folds easily with the seat attached in either direction, making it easy to store. 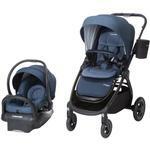 The Adorra Stroller is also super easy to clean thanks to the machine washable and dryer safe seat pad.